Imagine you have an important email to send your boss, and you know that she always checks her email first thing every morning at 6am. You could get up early to send the email, or you could just use Schedule Email to send it by 5:50a tomorrow morning. Announcing a new, free Chrome Extension, Schedule email. 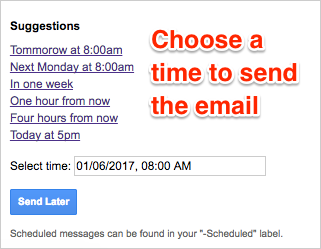 Once you’ve installed the Chrome extension, you’ll be able to schedule emails directly from within Gmail with only 2 little steps! Emails you’ve scheduled for later will be stored in the “Scheduled” label in the Gmail sidebar. If you need to edit or cancel the send, simply open the draft and make your changes.